The Big Mac, which celebrates its fortieth birthday this year, must have started it. The obsession with bigness. By now we take it for granted, without a conscious thought. 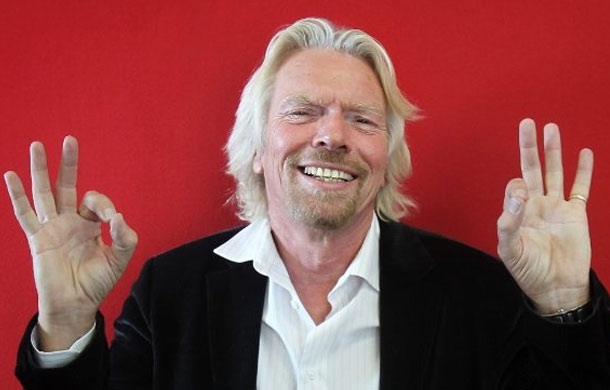 Everything you get is going to be big, by default, unless you make a special plea for small. Even then you might get something that’s only a little less big. Why is Big so big? The pat answer is, it’s in the nature of capitalism to induce you to pay for more than you need. Let me give you an example, drawn from a rather minor, but telling, example of global capital, Mr W., our excellent local butcher. He only sells meat of the highest quality, including the finest faggots (but only on Thursdays). He is universally respected by his customers, who come from far and wide, not just the village. Mr W. is the most genial butcher imaginable. If you buy a cut of lamb from him, he’s apt to say something like ‘that fine animal [sometimes he will give it a personal name] was skipping around in a field above M [the neighbouring village] only last week’. . In short, he makes you feel, like all really outstanding retailers, that he’s not selling you anything, but providing an essential personal social service. Now if you ask Mr W. for a chicken he’ll direct you to the selection of ex-chickens visible on his counter. They range, not from the small to the large, but from the large to the super-chicken. If you hint that you’re looking for a chicken for two people, a smallish one, he’ll start moving his hand toward that huge beast that only looks small in relation to the gigantic specimens sitting next to it. Only the most astute customer will be quick-witted enough to stay his hand and ask him whether he might have a truly small chicken hiding in a corner of his big fridge. And, fair play to him, Mr W. will then rummage in the back of his shop without complaint, and emerge with a chicken that doesn’t look as if it was in training to be a front row forward. All Mr W. is doing, of course, is taking his lead from the practice of the multinationals. Coffee chains, for example, don’t know the meaning of ‘small’. Their sizes start from ‘regular’, which is already large enough to send you running for the toilet within half an hour. I’ve never dared to ask for anything beyond ‘regular’. To take a third example, when was the last time you were able to buy a small apple? Supermarkets and most fruiterers simply assume that you have the mouth and stomach of Gog or Magog. If you do manage to find small apples they’ll almost certainly be labelled ‘children’s’. 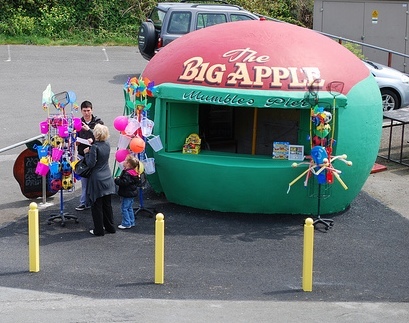 But why should you, a full-grown adult, be infantilised, be made to feel small, by buying children’s apples? A well-known variation on the Single Big is the BOGOF: buy one, get one free, or (more usual these days) three-for-the-price-of-two-and-a-half. This time you are intended to think about size, but again as a positive value, a way to save rather than waste your money. So how can Smallists fight back? Theoretical approaches have been tried. 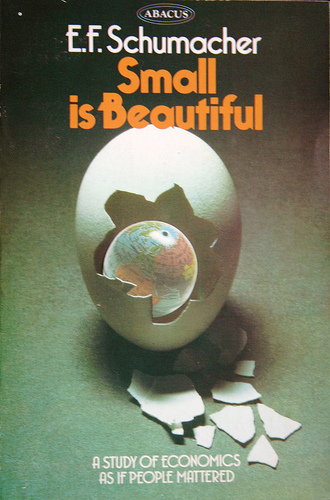 It’s forty years since E.F. Schumacher published his book Small is beautiful. It had a brief vogue at the time, especially in Wales where Schumacher lived, but not many people remember it today outside specialist green circles. Individual consumer behaviours, like going to farmers’ markets, can have limited effects. What’s starting to make more of a difference is our increasing poverty. Tesco and the other elephantine supermarkets are swiftly losing custom to smaller, more local shops and smaller supermarkets that don’t offer the same absurd range of choices, sourced from across the globe, for the same commodities, don’t cost so much, and don’t require long car journeys. But it will take more than a few adjustments to shake the foundations of bigism, which extend far beyond the retail industry. ‘Too big to fail’ was a phrase on economists’s lips in the early days of the global crisis. It referred to banks and other financial institutions that were so gigantic that their collapse was unthinkable – so unthinkable that billions of pounds of public money had to be thrown at them. Of course these monsters are still with us. No attempt has been made to cut them down to size so that they don’t endanger the whole economy the next time their owners see a quick way of quadrupling their wealth. In 1934, in the aftermath of the Crash and in the middle of the Depression, an American lawyer named Louis Brandeis published a book called The curse of bigness. He was referring to the effective monopoly power of giant companies like Standard Oil and the need for anti-trust laws to break them up. We seem to have learned nothing since his day. Big banks harbour big crimes, like the miss-selling, Libor and ‘forex’ scandals: crimes so big they can’t, it seems, be punished, except with unnoticed fines. Which brings us to the biggest, most blatant and seemingly ineradicable form of bigism, the gigantic wealth of the very rich. Like other forms of bigism this is mostly taken for granted as a natural feature of our economic system, of little interest to the rest of us. The rich are always with us. But that ignores one of the most striking trends in the western world since the late 1970s and the complete triumph of neo-liberalism. The very wealthy have gathered to themselves an ever greater share of the total wealth of a country, until by now the richest 1% of the UK population owns as much as the poorest 55%. While the meagre resources of the poor and powerless are increasingly under attack, there are almost no restraints on the self-enrichment of the extremely wealthy. For them, paying tax is optional, contributing to the common wealth an eccentricity. All this suggests that bigism is an unchallengeable ideology. But of course it isn’t. It’s only looks like it because we small people allow it to seem so. If enough of us started to demand smaller apples, chickens, banks and pots of gold, the bigists might start to feel the heat. I agree absolutely but do you think we might consider an exemption for all home made faggots of quality?Partridges are nice when you want a taste of poultry that doesn’t overwhelm but if you are up to your neck in large chickens you could get a couple of cats – they prefer it to Whiskas and it’s probably cheaper to feed them this way. Coincidentally I’d just been reading about Adam Lent’s new book “Small is Powerful: why the era of big business, big government and big culture is over (and why it’s a good thing)”, which is (of course) published as a crowdfunding venture: see http://unbound.co.uk/books/small-is-powerful. Adam is speaking at the RSA on 20 November, and we should be able to hear him at thersa.org. Seems your post is of the moment. 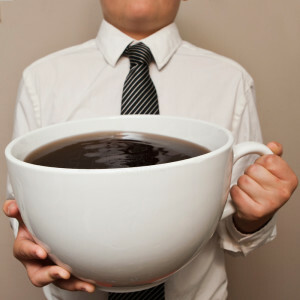 Oh, and I always ask for a small coffee, on principle. Interesting, Chris! I’m not sure that attacking big government, though, is necessarily a good thing. After all, that is the Cameron-Osborne-Clegg strategy for handing over what remains of public assets to their City friends. Is there really a Small alternative to state-provided complex public services, especially when citizen solidarity is now so enfeebled?